I spent last night making my 13 year old brother watch The Wizard of Oz for the first time - he acted like he wasn't impressed but he still watched all of it anyway haha. I think I've ruined his "street cred" woops! Anyway, I hope you're all having a good weekend, I'm currently listening to JLS - Do You Feel What I Feel? while eating rice. Now before I start to ramble about my love for Aston Merrygold, I just wanted to show you my wish list for 2012. I ♥ ♥ ♥ what I've picked and I wish I could afford to buy all of it! I've picked a mixture of going out outfits and just regular every day clothes, I'm struggling to pick my favourite item..Maybe the black heels from Miss Selfridge? I'm going to make another wish list/hot picks just from the online stores such as Missguided and ASOS. I've been lusting after the river island bag for agesss. Love the shoe boots too! I love those beaded shorts from Topshop...gorgeous! Great wishlist hun! I think mine has just expanded! 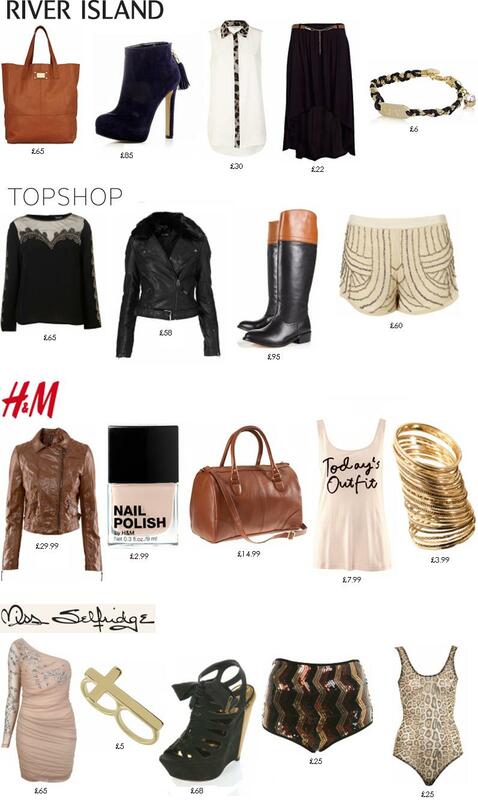 Love the river island blouse and the H+M top! I wish that river island shirt has sleeves! I love it though! your blog is very nice!! Love your wishlist! Especially the boots from Topshop and River Island! Really loving the boots from topshop and also the sequins shorts from Miss Selfridges are really amazing! LOVING those River Island shoe boots!